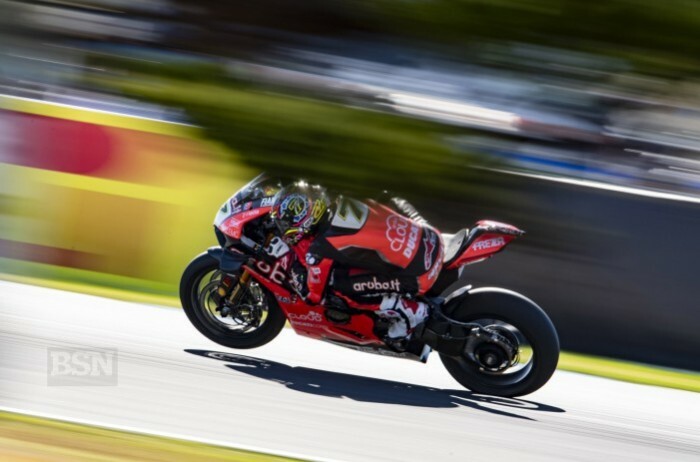 Chaz Davies has been unable to match the prowess of his brand new team-mate Alvaro Bautista so far. Or get the most out of his own new bike in 2019, but he made a set-up breakthrough over Saturday night in Thailand. Davies’ increase in performance saw him mixing it up more, particularly with Melandri, to their mutual cost, it appears. “With Marco, he was a little bit over the limit for sure,” said Davies. “I asked him about it and he conveniently didn’t seem to remember that he was 15kmph too fast and took me wide and lost a lot of positions. He passed me the lap before really clean, but that next lap was a bit of a lunge. He had a complete and utter lunge. If I wouldn’t have given way, I would not have stayed in the race. But that is racing, so we move on. Davies railed against a suggestion the Ducati was simply faster than its rivals in sector one and two, the site of all the big straights. “Did you watch any of the video with me on the bike, in amongst the other guys?” said Davies. “The advantage with me sat on it is not what it is on the other side of the garage, because he (Bautista) has 15kg on me. He obviously has a great feeling where he rolls through turn one quick and gets the throttle open early. It is a combination. Davies, who crashed in race one but still finished for one point, then was eighth in the sprint race for two points, got none for race three, after his big suffered a technical problem at turn five. Next up for Davies is arguably his favourite circuit, Motorland Aragon, in early April.